References to light are everywhere on Shabazz Palaces’ new album, Black Up. “Brilliant light, black light, blue light,” says Shabazz architect Ishmael Butler aka the Palaceer Lazaro. “I’m lucky to be able to see that in symbolic things. When a girl that you like talks, the way her eyes are, or the way she walks, or when your kids say your name—I feel those things in terms of light.” With an ever-piling heap of critical adulation and a steady stream of new releases, there is plenty of light on Butler, who’s no stranger to the glare after his stint with world-famous ’90s jazzbo rap clan Digable Planets. After a single show in their Seattle hometown last January, the duo, consisting of Butler and Zimbabwean percussion minister Tendai Mairaire, aka ’Dai, went from rumored unknowns to local scene paradigm shifters. The buzz began with a pair of forward-thinking EPs in 2009, but Black Up is the next step. Its crushing sound and mushrooms-kicking-in profundity play like some alien artifact, a transmission from long-dead ancestors reaching ears from the other end of the spiral. But Shabazz Palaces are light years from being merely another reactionary weirdo rap group on the underground circuit. “I’m not sitting around like, Ah, niggas ain’t doing this, Imma do that,” Butler says. “At the same time, I’m not oblivious to it either. For me, it’s just about being open to whatever vibrations are floating at that time that you can call up. I don’t really think too much about what other cats are doing, I’m just trying to put myself and ’Dai and the crowd and everybody to be in a position to get a good peak.” Onstage, the pair gets caught up in the rapture of the music, beating drum machine pads, swaying and bopping, blending a yogi’s clarity with a steely pimp cool. 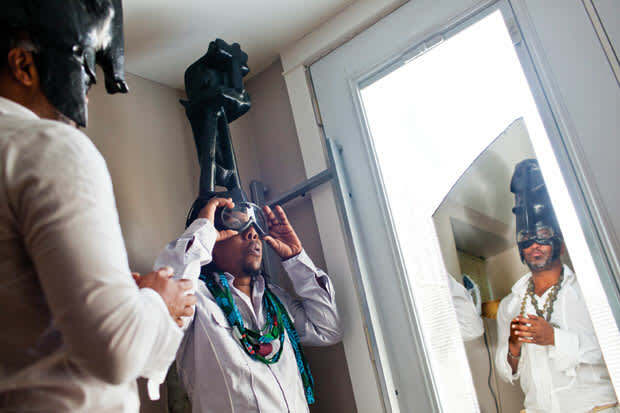 Shabazz Palaces make arresting rap, dystopian but always full of soul and spirituality. The group’s sound is sometimes stark but it’s also warm, vital and danceable. Heavy pours of post-rap sensibility, free jazz and sludgy screw can be found in each song’s multi-movements, all throbbing with unreal, life-affirming bass.